*I received a copy of this Blu-ray/DVD to review. However all opinions expressed are my own. 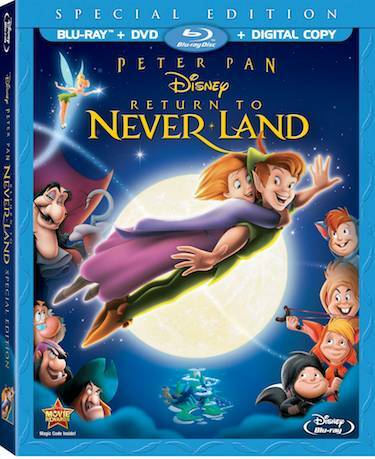 Share the power of believing with your family in Return To Never Land—now more spectacular than ever on Disney Blu-ray! You all know just how much I love Disney! This love for Disney came at an early age especially after seeing Peter Pan for the first time. This was actually one of the first Disney movies that I purchased for my kids and they love the movie just as much as I do. When I heard that they were releasing Return to Neverland from the vault for the first time ever on Blu-ray I knew I had to grab a copy for my own Disney movie collection. This is a great follow-up to the first Peter Pan and you will even get a chance to be introduced to a new character who is just as spunky as her mom. Return to Neverland is now available in stores and online so be sure to pick up a copy of your own today. What a classic! I cannot believe it has been so long since this movie was released. The kids will surely enjoy this! I don’t think this one has been available on DVD all that much, nevermind bluray. Return to neverland is one of my favorite disney sequels. My kids would love to see it. Peter Pan was one of our first Disney movies too. I should get it. I think that my son missed out on so many good movies. I love this movie! We’re a Peter Pan loving family. Do you know, I still don’t think I have ever seen this. Definitely need to pick it up for our collection. The girls will love this. I may add it to their holiday wish list. This is such a great classic and it’s fun to see it coming to blu-ray and DVD. I will have to keep an eye out for it when we are at the store. I love when they bring back out the classics, fun to go down memory lane. We have a copy and I have to admit it’s a pretty cute movie. I want to get this! I can’t wait to own this on Blu-ray!